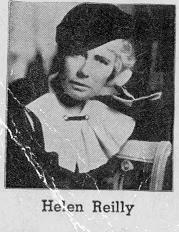 During my search for more Golden Age Mystery novelists, I have unearthed Helen Reilly. Born in 1891 in New York City, Reilly’s early books have been categorized as police procedurals, although the term was not in use at the time she was being published. To ensure accurate, realistic writing, Reilly conducted research with the New York Homicide squad. (Shades of Rick Castle, perhaps?) With a career that spanned from 1930 until her death in 1962, she published almost forty books. 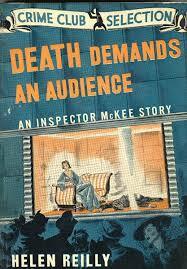 Her most popular character is Inspector Christopher McKee. Helen’s biography is sketchy. She married Pittsburgh, PA native and cartoonist Paul Reilly, who may have been somewhat older than she was; he passed away in 1944. Part of a creative family, two of her daughters, Ursula Curtiss and Mary McMullen were also mystery writers, as was her brother James Kieran. Blogger Mike Grost has written an extensive analyses of Helen’s work. He made several observations about her stories such as: the use of scientific detection, McKee’s fondness for high-tech phone and radio equipment, the inclusion of technological based communication and transportation centers, and the use of light and architecture throughout her stories. Interestingly, artists show up in many of her stories, as do many elite New Yorkers on a downward spiral. 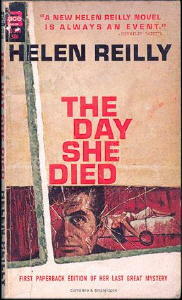 Helen published her last novel, The Day She Died, in 1962, the year of her own death.